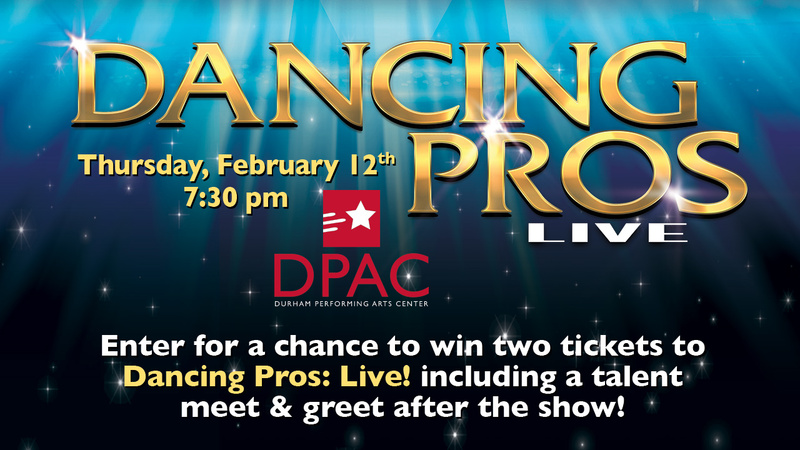 Enter for a chance to win two tickets to Dancing Pros: Live! at DPAC February 12th. You and a friend will enjoy a pre-show dinner at Cuban Revolution, premium show seating, and a chance to mingle with talent at a meet and greet after the show! The world's finest dancers will heat up the stage in Dancing Pros: Live, and the audience gets to vote for the best of the best! With a blend of artistry and athleticism, passion and lyricism, and sass and sophistication, ten of the world's most remarkable professional dancers compete with one another for top prize in this high-octane dance competition now touring the country! The spectacular show sparkles with amazing caliber singing, a glamorous set, stunning costumes, and unbelievable dance moves. From high voltage kicks to seductive strides, these famed competitors demand everyone's attention as they rival one another on the dance floor for a chance to win your vote! Dancing Pros: You Pick The Winner is a high-energy experience packed with top talent. Enjoy the wow! Top notch dancing from the best in the world and a live fan vote for the winner. If you like Dancing with the Stars you'll love the drama, excitement and unpredictability of Dancing Pros. Super talented dance masters go head to head.